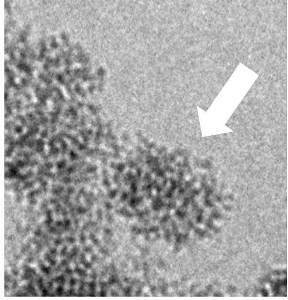 The crystalline nanoparticles (arrow) "bud" from an amorphous network which is already nanostructured. Understanding the formation of nanoparticles in water at room temperature is a major challenge, both to tackle the mechanisms of mineral growth in biological systems, and to synthesise efficiently nanomaterials. However, the growth mechanisms usually invoked sometimes fail dramatically to describe reality, especially the final size, the crystalline quality and rate of production of the nanocrystals. Progress in this area are slow because of the great difficulty in observing the intermediate steps between the solution before reaction, and the construction of the first nanocrystal. A group of researchers from the IRAMIS/NIMBE, the Laboratory of Condensed Matter Physics at the École Polytechnique and the Université Pierre-et-Marie-Curie has managed this feat by using in particular the SOLEIL synchrotron radiation. Their observations allowed to propose a formation scenario which is unusual, but consistent with reality, and probably very generic. These results have been recently published in ACS Nano. 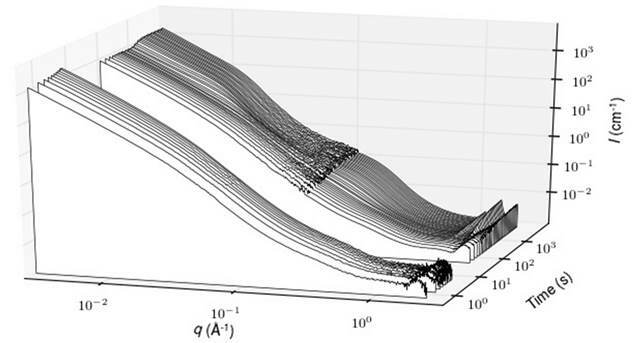 X-ray scattering pattern as a function of reaction time, which has allowed evidencing the intermediate amorphous phase and the role of its morphology in the production of nanocrystals. Sketch of the formation mechanism of the YVO4:Eu nanoparticles. This shows that the formation of these YVO4:Eu nanoparticles takes place in two steps: first, a nanostructured amorphous phase precipitates (t < 400 ms), which then crystallizes. The major finding of this study is that the transient amorphous phase is already nanostructured (aggregates of 30 nm composed of nanometer-scaled grains), and that this nanostructure constraints the shape of the final nanoparticles (40 nm aggregates, consisting of nanoscale crystalline grains). There is therefore a "template" effect, i.e. an initial constraint which imposes the final shape. This result is significant as (i) many synthetic nanocrystals have the same morphology, suggesting the very generic nature of our observations, and (ii) the template effect is by contrast absent from observations conducted on biologic minerals (calcium phosphate), since in that case the grains of the amorphous phase coalescence prior to crystallisation. The observations made on these luminescent nanoparticles first reinforce the modern theories of nucleation, then allow identification of effective levers to guide the nanostructure of a broad class of oxides synthesized in aqueous phase, either inspired by the observations performed on these synthetic YVO4:Eu nanoparticles, or on nanocrystals produced in biological systems. Contacts for CEA: Blaise Fleury, Olivier Spalla, David Carriere.